Character: Pale green, smooth with delicate and exquisite Jasmine flavor. Each ball is made with spring production green leaf, only available for a few weeks per year, scented with fresh Jasmine. The long silvery leaves are carefully hand-tied in an intricate pattern that unfurls into a chrysanthemum like shape when infused. The resulting cup is at once light and profound with sweet notes of asmine and wisps of fresh honey. 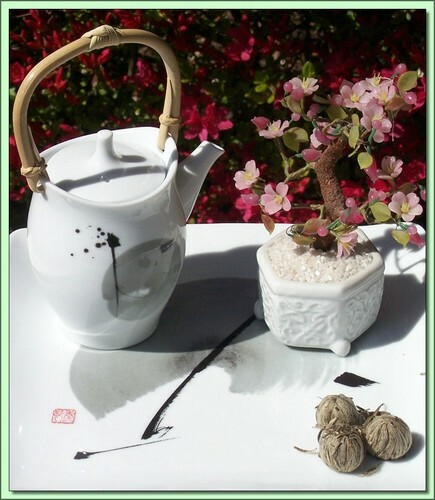 Hot Tea: This tea is best enjoyed by pouring boiling water over a jasmine silver ball for 5 minutes or until it opens completely. Don't remove. Can be infused repeatedly 2-3 times using higher temperatures & shorter (1-3 minute) infusions until flavor is exhausted. Iced Tea: Pour 1 1/4 cups of hot water over 3 Jasmine Silver Balls and steep for 5 minutes. Pour into pitcher while straining leaves, add ice and top up with cold water to make a quart of iced tea. Garnish and sweeten to taste.